You will earn 6,875 Reward Points. Earn 1 reward point for every 1 dollar spent. ¾" rear gas connection and gas pressure regulator. Stainless steel front, sides and front top ledge with “Cool Bullnose” design. One 27,000 BTU/hr. “U” shaped aluminized steel burner for every 12" of griddle width. Spatula wide 3½" grease gutter and chute is fully welded for easier cleaning and to stop grease migration. Low profile heavy duty gas griddle. Stainless steel front, sides and front top ledge. Fully welded stainless and aluminized steel body frame. 11" low profile cooking height on 4" legs. 1" thick polished steel griddle plate with 12 gage, 4" stainless steel back and tapered side splashes. Grease chute is fully welded to stop grease migration. One 27,000 BTU/hr. “U” shaped aluminized steel burner and mechanical snap action thermostat for each 12" of griddle width. Temperature adjusts from 200° to 550° F. One pilot safety for every two burners. 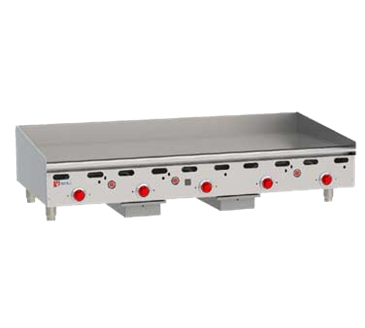 3 ½" wide stainless steel grease trough. ¾" rear gas connection and gas pressure regulator. Exterior Dimensions: __"w x 33" d x 15 ½" h on 4" legs. CSA design certified. NSF listed. SPECIFY TYPE OF GAS WHEN ORDERING. SPECIFY ALTITUDE WHEN ABOVE 3,999 FT.
Gas type to be specified LP gas, specify elevation if over 2,000 ft. Natural gas, specify elevation if over 2,000 ft.